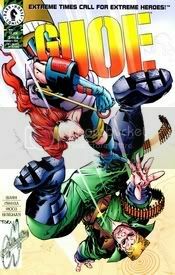 GI JOE EXTREME VOLUME ONE ISSUE #3- BLOOD FOR THE BARON!!! With its ability to enhance the growth of vegetation, Ferti-Gel may well be the solution to world hunger -- it could make famine a thing of the past. But there are some who thrive on the hunger of others, factions who seek profit in every solution. And, fortunately, there are also those who would stand against such evil. Ballistic, Black Dragon, Freight, Harthingy, Mayday, Metalhead, Quick Stryke, Sgt. Savage, and Lt. Stone -- separately they are unique individuals with superior physical skills, intelligence, and the finest military training. Together, they are the vanguard against whatever forces may threaten freedom in the world of the 21st century! Together, they are GI JOE. Summary: We open with a caption telling us we're: "In a mysterious, 'high tech' dungeon, below the country of Mklavia: The GI Joe called Quick Stryke has come in search of his brother who he believes is held captive by the evil Iron Klaw." A second caption tells us: He was expecting a trap. Which was a good thing, since that's what he's found. Quick Stryke dodges a weapons blast from Barbican (soon to be known as Rampage), one of the Iron Klaw's lackeys. Quick Stryke tells Rampage that he'll deal with Iron Klaw but not his errand boy. Rampage doesn't take kindly to being called an errand boy. He tells Quick Stryke that he'll "be sorry you said that little man". In turn, Quick Stryke doesn't take too kindly to being called "leetle mon" as he puts it (he's got a Caribbean accent, don'tcha know?). Quick Stryke manages to knock Rampage out cold (temporarily) and runs over to the figure strapped to the wall that may or may not be his brother. That's right. It's a trap; the figure is a dummy, rather than Quick Stryke's brother. The distraction of the figure gives Rampage enough time to recover and counter attack. He also taunts Quick Stryke by telling him that the mannequin on the wall isn't the only dummy in the room (ha-ha). Quick Stryke counters with "Better to be a dummy den a dog who licks de boots of the Iron Klaw!" Now THAT really makes Rampage mad and he proceeds to hulk out on Quick Stryke. Actually, he doesn't bulk up much at all, just turns green, his eyes go red and his hair gets shaggier. He's smaller than Quick Stryke, even beefed up. He's definitely smaller than Freight...but then, city busses are smaller than Freight. Rampage leaps at Quick Stryke who curses his stupid pride for getting him into this situation and not coming in with back up. The scene shifts, from Quick Stryke's fight with Rampage to Lt. Stone and Clancy falling from the plane. "If Lt. Stone found out what a mess I was in," Quick Stryke says in a caption. "I'd never live it down." 'Course, the joke is that at the moment, Lt. Stone is in a much bigger mess than Quick Stryke. Iron Klaw gloats over his success: things are going better than he'd dared hope. Not only has he gotten the Ferti-Gel, he's also removed the leader of GI Joe as an obstacle to his plans. The Joe copters are managing to route thet SKAR forces, except for Mayday who turns her copter around and heads back to try and rescue Stone and Clancy. She tells Ballistic to bring up two chutes while she sets the autopilot. She's planning on going out to rescue Clancy and Stone. Ballistic thinks she's nuts, but Mayday figures that it's her fault they took the fall. And she's going to bail them out of it. Ballistic muses that she probably returns her library books on time. The other Joes notice Mayday's taken a powder, making things tougher on them but then again, fighting one on one is too easy. They begin to route the SKAR forces. Inside the captured Joe plane, Iron Klaw runs for the survival craft, telling an underling to move aside. The underling protests, saying that the craft can carry two, but Iron Klaw says his life is worth twice as much as the soldier's. He then claws the soldier across the face. Mayday and Ballistic dive toward Clancy and Stone, grabbing them in the nick of time. They pull their chute cords and save the others. Ballistic and Clancy land right on a convenient bull's-eye painted on the ground (most likely the target for the Ferti-Gel test). Ballistic flirts a bit with Mayday, who's having none of it. Stone rips into Mayday for her "grandstanding." The mission is more important than any one soldier he tells her. Mayday says she guesses that she forgot that in the heat of the moment. Stone asks Mayday if there's any reason why he should "forget" to discipline her. Mayday says, "None, Lieutenant." The Joes shoot down Iron Klaw's plane; Harpoon makes the final shot. Iron Klaw, still in the escape vehicle, dismisses the Joes as fools, for "what use is one captured minnow when the shark eludes the net?" Mayday, Stone and the others bolt as the plane comes arrowing in on the target where they've landed. The plane crashes, releasing Ferti-Gel from the wreckage. In the next panel, we see the once-barren area blossom with new life. Plants grow almost instantaneously. The announcer thanks the ladies and gentlemen for coming, this concludes the demonstration. Meanwhile, Quick Stryke has been snagged by two robotic soldiers, who are holding him for Rampage to hit. Quick Stryke tells Rampage to let him go, make things even. Rampage isn't having any of it, though, since that's way too much of a fair fight for him. Instead, he proceeds to whale on Quick Stryke. Rampage knocks Quick Stryke cold and reverts to normal, saying that he feels much better now. He tells the Skyrenes (the robots) to make their guest uncomfortable while he reports to Iron Klaw. Rampage tells Iron Klaw that he's been successful and that he's expecting his bonus. Iron Klaw says that he doesn't remember any "bonus" but fortunately he is feeling generous since he's just discovered a new use for the Ferti-Gel. Rampage asks what it is but Iron Klaw tells him to pray he never finds out, since it's a secret he'll only share with his enemies. He tells Rampage to cage Quick Stryke and wait for the Joes to come rescue him. Rampage wonders how the Joes will find Quick Stryke. Iron Klaw assures him that they will somehow, they always do. But this time he's prepared, so alert the others. Meanwhile: Mr. Clancy is talking with the Joes, telling them that it's two to nothing in the last inning. The Iron Klaw has a sample of the Ferti-Gel and Quick Stryke has disappeared. He says that this can't be a coincidence. The rest of the Joes don't believe it. Sgt. Savage says that Quick Stryke was working on his lapcomp the last time he saw him. Maybe there's a connection there. Metalhead works over Quick Stryke's laptop, trying to read the files that Quick Stryke erased. There's enough residual data for him to reconstruct them. He continues on a somewhat rambling explanation only to be interrupted by Short Fuse. Metalhead teases Short Fuse for his short temper and says that he can reconstruct the instructions that Iron Klaw sent Quick Stryke. Tall Sally gives Metalhead a big hug, telling him that he did great! The attention embarrasses Metalhead. The Joes take off, Stone telling them that there'll be plenty of time for clowning around when the mission is over. Meanwhile: Iron Klaw is in an audience with the Duchess. He is seeking to make amends with her for their earlier quarrel by presenting her with a weapon that will allow her and SKAR to rule the world. The Duchess is not pleased by what she sees as Iron Klaw's continued disobedience. She doesn't want to rule the world, only her country like her father had before her. She also wants Mklavia to be a world power. Iron Klaw: "To your goals, Duchess -- may they prevail as long as you live." HINT! HINT! Message for you Duchess! That sound you hear is the clue phone ringing! Iron Klaw and the Duchess drink, then the Duchess drops her glass and grabs her throat. "Hrrrk!" she says. Apparently she wasn't able to get to the clue phone in time. A SKAR soldier asks what happening to the Duchess. Iron Klaw replies that she's dying. The Duchess: "Iron Klaw, you Judas. I h ave taught you well." Iron Klaw: "Correction: she is dead. Due to a drop of poison gel in her wine." Iron Klaw tells the SKAR soldiers in the room that he killed the Duchess as she'd have killed him and as he'll kill any SKAR member who doesn't accept him as their absolute and unchallenged ruler. ...well? he says to the soldiers present. "ALL HAIL THE IRON KLAW!" chorus the soldiers, smart enough to know which way the wind is blowing. Meanwhile: the Joes arrive at the bomb shelter where Quick Stryke was told to come to. Stone tells Short Fuse to get gas grenades ready and for Freight to make like a doorman. Freight breaks the doors down. Black Dragon and Tall Sally take point. A group of SKAR soldiers stand around complaining about being bored and wishing that something interesting would happen. They get their wish when Black Dragon and Tall Sally then take the foolish guards out. Stone congratulates his people on a good job then yells "Combat Mote! They were waiting for us!" The scene switches to the three dudes who were the cause of Stone's ruckus. One is Rampage; the other two we haven't met yet (at least in this issue), but we'll learn next issue that they're Inferno and Wreckage. Wreckage: "No points for guessing that, Stone." Inferno: "If you're so hot to find your friend, we'll help you." Rampage: "...all you have to do is get past us!" We end the issue on this bit of taunting. Commentary: Now we're getting to the meat of things; Iron Klaw has the Ferti-gel and the leadership of SKAR, he's managed to collect two new soldiers (though I have the feeling that they are probably introduced in the first issue of the series. Inferno gets an origin story of sorts in the backup story "From the Ashes". The betrayal of the Duchess wasn't exactly unexpected. It was a nice change of pace to see the leader of an evil terrorist organization who was interested more in a small term goal like ruling one country than biting off more than she could chew and going for the world. Pity she's dead, eh wot?